Directors: Gerry Anderson, David Lane, etc. Gerry Anderson's TV series UFO, a thirty-year-old vision of a shiny pop art future that sadly never came to pass, has been revivified by some exemplary restoration work. 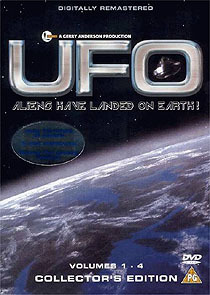 It’s unlikely that any series of this vintage has ever looked quite as good as UFO does here, thanks to good-quality 35mm source materials, state-of-the-art telecine transfers and some expert restoration work. 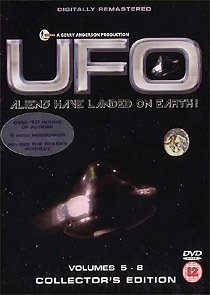 The discs are presented in their original 4:3 (1.33:1) ratio, with mono sound (at 192kbps). Carlton haven’t been stingy with the presentation or the bonus materials, either: the elaborate animated menus lead to a surprisingly frank commentary track by Anderson (on the first episode, Identified, which he also directed); a few deleted scenes (including some previously unseen gory alternative shots); descriptions of others that no longer survive; and several annotated photo’ galleries. The series' best episodes are in the second half of the series, but several in the first box set are nevertheless noteworthy, including A Question of Priorities, which places the commander’s son in jeopardy, and the espionage mystery Court Martial. Although ostensibly a single series, work on the show was halted mid-way when the studio facilities the production team were using were sold from underneath them, allowing time for some mid-season tweaking as they relocated to a new base. There are fewer tangible extras on the second set (there’s a disappointingly hesitant commentary track by star Ed Bishop on Sub-Smash, and an array of stills, memorabilia, storyboard and artwork galleries), but the episodes on offer are markedly better, including E.S.P. (a man (John Stratton) with supernatural powers becomes entangled with the SHADO organisation when a UFO crashes into his home); The Cat With Ten Lives (a quirky tale of possession starring The Prisoner’s Alexis Kanner); and three deliriously trippy adventures: Mindbender, The Long Sleep and Timelash.